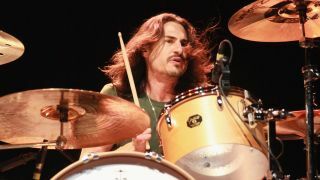 Drummer Brad says 2011 show was "good way to go out"
Rage Against The Machine drummer Brad Wilk says the band will probably never perform together again. The sticksman, who appeared on Black Sabbath’s comeback album 13 last year, believes his outfit’s headline slot at the LA Rising festival in 2011 was their swan song. He tells Pulse of Radio: “As far as I know, we played our last show at the Coliseum – and if that was our last show, that’s a good way to go out. In 2009, their anthem Killing In The Name took the UK Christmas number one single slot after a campaign by music fans to prevent the X Factor gameshow winner taking top spot for the fifth year in a row. At the time frontman Zach de la Rocha described the chart victory as “an incredible organic grassroots campaign.” They later played a free concert in London to celebrate the event.